Snowboarders across the world took part in record breaking celebrations on the sixth annual World Snowboard Day. The day hosted 167 events in 37 countries that allowed snowboarders of all different levels, from beginner to expert, to take part in activities free of charge. 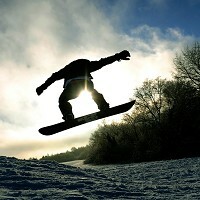 Snowboarding is an action-packed, adrenaline-fuelled sport that is fun for people of all ages and levels of expertise. But fans are advised to take out sports travel insurance if they take to the piste, just in case of injury. Three new countries helped World Snowboard Day make history this year by staging activities for free, pushing the total number of events up to 167 and helping the 2011 festivities surpass those of the previous year, when 160 events took place. Some of the events held on the day included first-timer snowboard lessons, demonstrations, competitions, gear tests, film showing, barbecues, concerts, photo contests and evening parties. And organisers are already looking ahead to next year, with December 23 pencilled in for the seventh edition of World Snowboard Day in 2012, which will attempt to smash this year's record.